The CANDY CLASSIFIED Series of AB’s Blog will provide store owners & management with the best industry information to help carry out new ideas for marketing and management in 2014. Marketing products to customers in a c-store should be based on one thing – Happiness. What is going to make c-store customers happy? Based on your customers’ behaviors, you can approach selling product in your store in a NEW way; both profitable and creative. Are my customers buying gas and coffee? Are my customers buying coffee and a breakfast sandwich? Are my customers buying a soft drink and candy bar? Are my customers purchases related to the weather? Based on your research, begin to develop new ways to tie these behaviors together with the brands and products that fit; creating a “Sure Sale”. Or a “Double Whammy; sell two things for one price. Maybe even a trifecta! Start a “FAST BITE BREAKFAST SANDWICH WITH A CUP OF COFFEE FOR $1.99″ promotion in your store today. We have seen GREAT successes with our stores already participating. Contact the AB FOOD SERVICE EXPERTS today at 800-207-2553 x 133 to discuss coffee programs, sandwich programs, or more. Trick or Treat – AB’s Favorite Halloween Chocolate! (74%) of consumers say they are okay with treating themselves to chocolate around Halloween. “It’s very convenient and it’s on my way to work,” shopper Dr. Ann Craig said. Customers will pay for convenience even if it’s a few cents more. Do not miss out on the opportunity for SCREMING SALES from impulse or last-minute shoppers. Halloween is 22 days away. On A Roll! Foodservice in C-Stores is an $11 Billion Industry!! CONVENIENCE DISTRIBUTION September-October 2013 Page 63. According to the National Association of Convenience Stores “Annual State of the Industry Report,” food prepared on site (which includes roller) was $242,976 per store per year in 2012. This was an increase of 2.7 percent over 2011. This article begins with our sales manager, John Quisito, speaking about Allen Brothers continued growth in Foodservice over the past few years. The article is a great source of information to help you make the most of your roller grill program and build your profits by increasing the quality and food service programs you offer your customers. Take away key elements to help you develop or improve your food service plan! AB’s September Fall Savings…Its Common Sense, Order Today! Fall is here. School has started. Make sure to take advantage of all the SUPER SAVINGS Allen Brothers has to offer. New products, great school stock up items, store management products, healthy selections, and so much more. Our variety is always getting better. We distribute the top trend items for CSTORES and the most popular food products in the market. 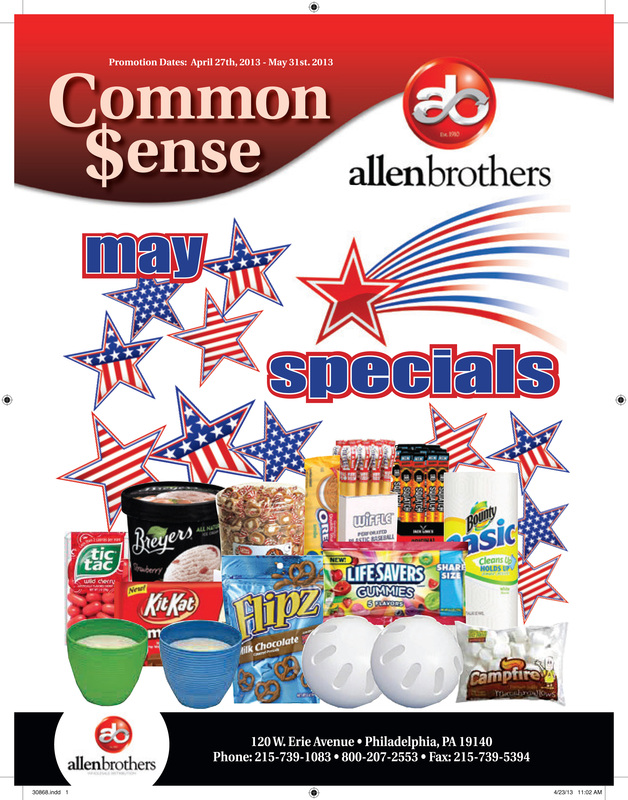 Check out this month’s Common Sense; SPOT THE DOT and Save! Is a gloomy, rainy day causing slow sales? Try putting a sign outside of your store on the sidewalk; visible to those walking by or at the pumps. List items that pair with the weather. For example “Rainy Day? We are always open! Umbrellas, RainX ®, Coffee, Hot Pizza, & more. Come dry off and grab a delicious snack”. Use cardboard and a visible marker for practically no cost at all. If you have extra marketing funds, a better idea would be to create and laminate poster size signs for different needs of attracting customers; weather, open on holidays, special offers (Hot Dog & Soda for one price). Also, you can buy a sign with an erasable board. Your goal is to bring customers in the door and signage is the first impression your customers receive. You can purchase signs and sign holders on signage websites (Google: Sidewalk signs or store signs) and at a Home Depot or Lowes. 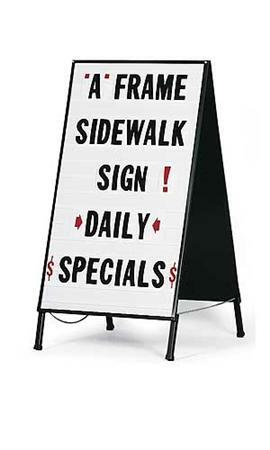 A sidewalk sign is called an A-FRAME sign. AB Is Back On The Blog! Allen Brothers is back on the BLOG! Sorry it’s been a while but we are back in the creative neighborhood and more fun than ever. You should know we have a new writer, new products, and lots of new information coming your way to help you build your business and reach your highest potential. 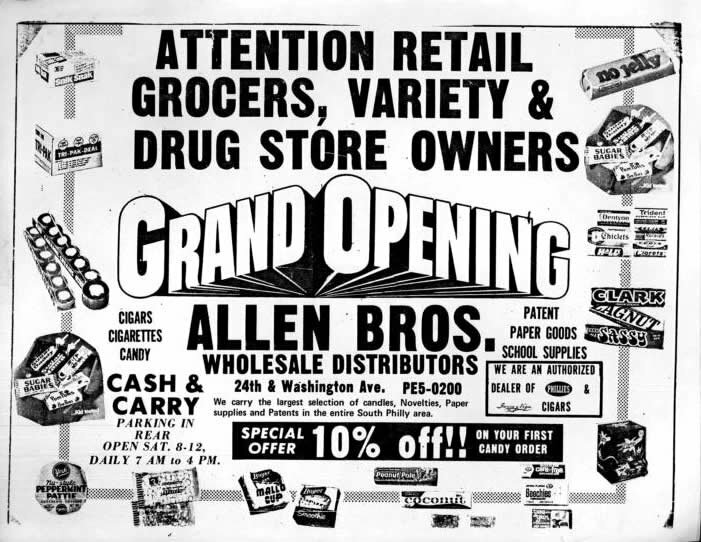 Allen Brothers has been operating since 1910 and there is definitely one thing that has not changed! AB cares about their customers, provides quality products, and continues to be innovative; staying ahead of the times with product selection and communication. The sales flyer that started it all! And now 103 years later, it’s just Common $ense to buy from AB! Stay connected. Find us on FB and Twitter also. AB’s October Common Sense: Promotions so good, it’s frightening.